MaiTai's Picture Book: Bienvenu au printemps - happy beginning of spring! Bienvenu au printemps - happy beginning of spring! As you probably know, I do not wear pink very often. But when spring comes and showers us with pretty pale blossoms, I can never resist joining in..
From snow covered slopes to spring blossom... ! I adore your picture of the pink flowers on the strong lines of branches against the blue sky - it is, in every sense, uplifting. Your post is a timely reminder too, as seasons change, to revisit our scarf collection and find new ways to wear the ones that challenge a little. 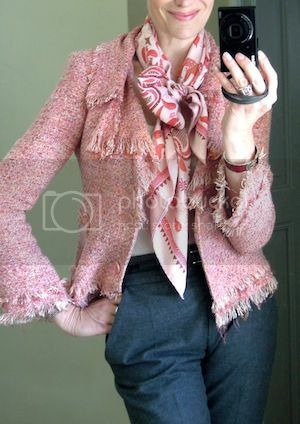 Your pink fringed jacket nicely sets the mood for Carre Kantha - bravo! Fabulous jacket! Love it with the Carré Kantha. The pink palette is lovely on you. You remind us all to keep an open mind to our preferences. I tend to my get in habits with my favorite looks or colours. Sometimes life has surprises. 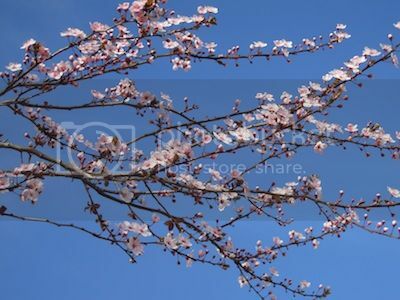 Your photos of the blossoms remind me of the design Vol Amoureux des Azurés. Thanks for another lovely post. I know you are not a huge fan of pink but it suits you very well. First trees covered in blossom here, too, probably helped along by some warm weather a few weeks ago. Pretty in pink:)This is not a color I visit often,but I am inspired by your pairings! Love the jacket,sort of edgy..would look great with jeans! Again,YOU LOOK GOOD IN EVERY COLOR! Love that jacket. I know you don't wear pink often and I always wonder why not, it looks so good on you. 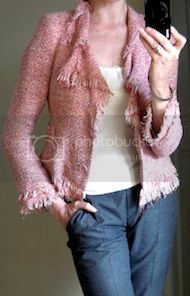 (Says me wearing a pink wrap cardi today, maybe I'm just a pink fan!!) Your Carre Kantha is one of my favourites. Such a lovely toast to spring! You should wear pink more often it suits you very well. I think that you look exquisite and graceful,MaiTai. The blooms are gorgeous.Is it an almond tree?? How do you complete this look? I mean: bag, shoes and coat, if any. Btw I have a question regarding one of your previous posts: how can I get the silk ribbon (included in the 'Paris mon ami' special edition envelope)? My SA doesn't seem to know what I am talking about...strange.. So delighted to see you in the pink of health!! ANd it seemed like you so enjoyed your family and ski holiday!! What a fabulous post......love the jacket with the stunning H silk...so chic!!! Nice to have you back....missed you!! May I come play in your closet? 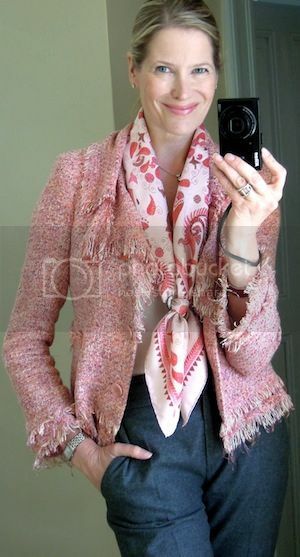 :-) Your jacket is so lovely, both fabric and style, and so well complimented by your scarf. Your last comment to me made me smile! Wearing today, in your honor and with your encouragement, my most beloved so far, my GM Ex Libris Dip Dye in Fuchsia, Rouge Orange...scrumptious to wear! And so cheery a color in early spring...our white lilacs are blooming, and smell wonderful. You look truly gorgeous in pink, dear MT! And I love the jacket. You look pretty in pink, my dear MaiTai! You should wear pink more often because it makes you glow. You look radiant! Love that jacket and a big THANK YOU for naming the sources of your beautiful pieces. I have always wondered where some of your fabulous non-H items come from. Please keep it up. Have you considered carrying your beautiful Rubis Picotin with something pink? 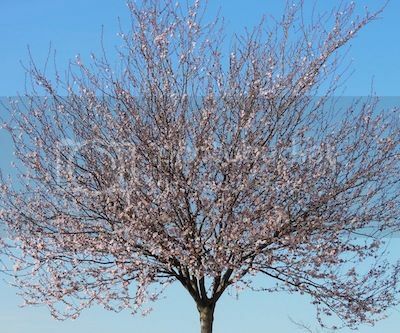 Oui, c'est très joli: l'arbre en fleurs et Vous dans votre rose. Et chez nous aujourd'hui nous avons beaucoup de neige. Tombe la neige. Tous les arbres sont blancs. thank you for this lovely idea. I am itching to play with spring colors. But a few month ago I started to work as a school teacher, in a primary school. I have to do lots of paintings and handicrafts with the children. So I grab jeans and sweaters in the morning – clothes to deal with watercolor and glue. But, frankly, I don't like this very convenient look. Do you have any suggestions how I could give my clothes a little bit pizazz? How could a teacher dress without looking dull? I love your look and have been trying to incorporate silk scarces in my outfits. They look very chic and youthful on you. I feel they are aging me, even when I wear them with current trends. Do you have any tips or thoughts on this? I seem to have the same issue with other classic accessories (pearls!) that I adore. I remember this being your least favorite scarf, but I truly love this scarf and color on you. I would also be interested to know if Zara has had a run on this jacket! LOL. It's quite striking, but most likely so because of the person modeling it. Bienchen, many thanks for the heads up. I changed the settings, hope it works! Anonymous, the special edition envelope is A4 sized, and contains the ‘Paris mon ami’ catalogue, a post card with the silk ribbon wound round and ten paper enamel bracelets (they come in a ‘booklet, have glossy and metalic print and can be worn around the wrist). Anonymous, it was warm enough to go outside without a coat. Re the bag: this outfit exposed a gap in my collection ;) As a compromise, I went for my etoupe Picotin (a black Birkin felt too heavy for this light and lovely day, and the rubis Picotin too matchy matchy). For shoes I chose grey ballet flats. Anne, I often dress in jeans and sweaters, it’s my favorite winter uniform. Find shapes and colors which flatter you, and then jazz up with accessories... scarves, necklaces, shoes and braclets. Have fun experimenting! Maitai, the change of settiongs has worked, much easier for me to follow and of course you can reply to a comment (as I do now). Not cherry blossom but a form of plum, horticulturally they are from the same genus (prunus). Wow, the reply function is so cool! Thank you, Bienchen :) Thanks also for identifying the blossom. Have a great weekend! Thank you @Bienchen,@MaiTai.I guess i got a little nostalgic because the almond trees are in full bloom in Crete this time of the year and i must confess that i miss my island so much! Have a wonderfull sunday morning. Mai Tai, you must wear colours more often, you look so lovely in them! This post genuinely brought a smile to my face. You look like the Barbie doll I had as a child (I mean that in the best possible way). I do have a special fondness for blondes in pink, and this is just lovely. I believe I remember you saying that this scarf wasn't one of your favourites, but it's absolutely gorgeous with your colouring, and I do so hope it makes more frequent appearances. Dear MaiTai, I know you do not care to wear pink often, however, when you do, as with everything you do, you wear it beautifully. Thank you for such glorious photos of the coming season and sharing your beautiful self. You look so lovely in the pink!! I know it's not your favorite, but it is mine!! It was a perfect outfit from the inspiration of the cherry blossom tree! You look perfectly lovely in every color you wear, and pink surely is one of them. I understand your disinclination towards the color, but oh, you are just pretty as the cherry blossoms in the photos.